Dried kokum is used in Indian cooking because of its sour taste. What makes kokum unusual is that, unlike other sour foods—lemon, lime, vinegar, tomato—kokum does not increase pitta’s fiery nature. If you have pitta problems and eat too much of these other sour foods, you can set yourself up for a lot of pitta maladies. These include acid indigestion and acid reflux as well as skin problems, headaches, and irritability. This doesn’t happen when you eat foods seasoned with kokum. In fact, kokum has a calming effect on pitta and on pitta ailments because its taste is more complex than sour alone. Rather, it is both a mixture of sour with sweet. I’ve started using kokum in some soups and dals so we can enjoy its sour spike without the headache—figuratively and literally—of causing pitta problems around our house. Kokum lacks the prestige and loyal following of tomatoes or balsamic vinegar, but it’s serviceable when you’re avoiding those foods. Finally, in this soup I’ve included one other ingredient you may not have come across yet: asafetida (sometimes spelled asafoetida), another favorite of Ayurvedic cooks. I’ll do a blog about asafetida another time, but in brief, it helps digest legumes, especially those pesky hard beans. 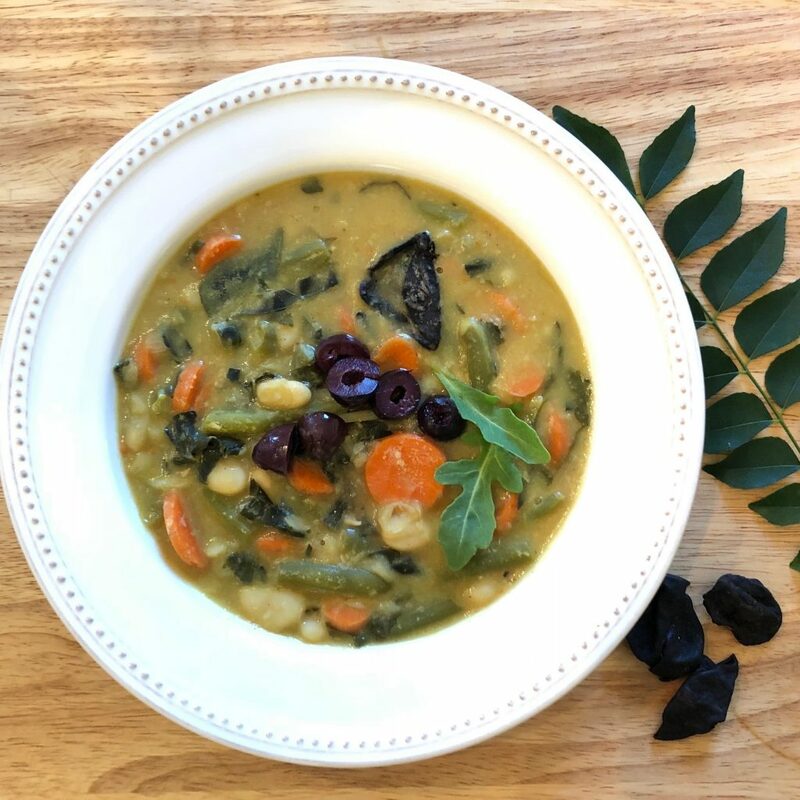 In any case, I think you’ll love this Vegan White Bean Soup during these cold winter nights—with or without kokum! P.S. You can find kokum in Asian food markets and also online. Cook’s Tip: You can replace kokum with a teaspoon of fresh lime juice. 1. Soak the beans in cold water for 8 to 12 hours. After soaking, rinse the beans well and strain. Cook the beans with water in a stainless steel pot or pressure cooker. If using a pressure cooker, the beans may need to be cooked an additional 20 minutes or more on medium heat after the pressure releases. 2. While the beans are cooking, dice the shallots. Heat 2 tablespoons of oil in a sauté pan on medium heat. Add the shallots, asafetida, and curry leaves, and sauté, stirring occasionally, for about 10 minutes, until the shallots turn golden brown. Add the cumin, coriander, and turmeric, stir, and set aside. 3. Once the beans have cooked a half hour, add the green beans, kokum, chopped kale, garlic, and ginger. When the white and green beans are completely tender, add the shallot/spice mixture and salt, to taste. You can serve the soup with the kokum or take it out, if you prefer. If not using kokum, add some lime, to taste, and serve.